Councilman Ron Papandrea (right) and Rev. W.J. Rideout III (left) on Let It Rip. 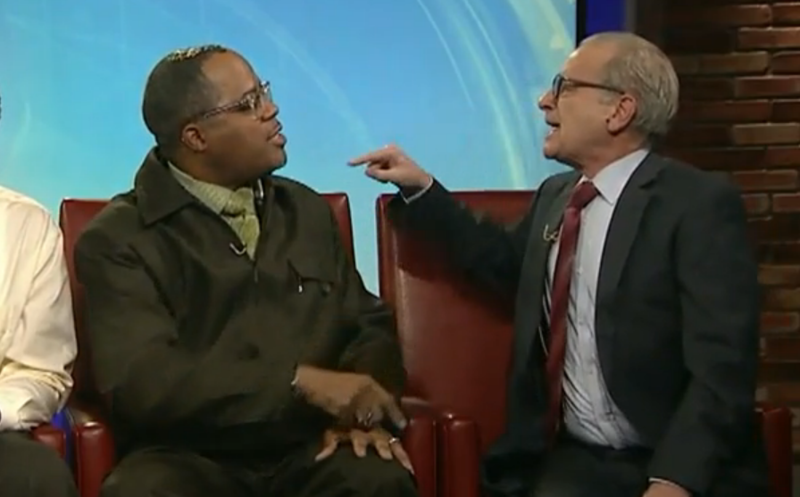 Southfield police are investigating a Warren City Councilman who threatened to choke a pastor and civil rights leader during and after a segment of Fox 2’s Let It Rip last week. Rev. W.J. Rideout III filed an assault complaint Tuesday against Councilman Ron Papandrea, who was escorted out of Fox 2’s studio and building by security. Rideout also filed a complaint with the U.S. Attorney General because Papandrea is an attorney. “Would you shut up and let me speak?” Papandrea exclaimed during the show before standing up and making a choking gesture. After the segment, Papandrea repeatedly said in the studio that he wanted “to choke” Rideout, prompting security to remove the councilman from the building. On Tuesday, Rideout joined dozens of people calling for Mayor Fouts to resign at a Warren City Council meeting. At the ending of the meeting, the council decided to take no action over the recordings.